-Do opening Chess books become quickly and easily outdated now ? -If the player blindly follows those databases and engine recommendations, will s/he be playing what the engine decides and not what s/he decide?. -The numerical assessments engines give to moves may be misleading. BUT if the player puts his/her confidence on them, will s/he end up following the engine move after move for fear of deviating and playing a move considered unfavourable by the program? -Can today’s CC be played without the aid of an engine knowing that your opponents are employing them? -Can the engine analytical brute force be met by an ultrapositional approach and no engine at all? 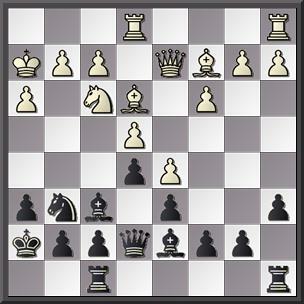 -In today’s CC games could it be possible to apply, for instance, restraint, blockade,overprotection and openings like 1. e3 , 1. Nf3 /2. e3, etc? (If so, do not use a computer…) and survive? The introduction to the tournaments and the games offers objective analysis but also Nimzowitsch states of mind. We see him showing doubts, joy, disillusion, self-distrust, renewed confidence… We see how he uses his beloved “system” against his honourable opponents (names like Capablanca,Alekhine,Bernstein,Becker,Spielmann,Rubinstein, Marshall,Bogoljubow, Vidmar, Stahlberg, Yates,Tartakower, and so on), opponents with different approaches to Chess and against whom he tries his ideas and explains the conclusions. White to play wins. Horowitz & Kling. It resembles a real game, this is why I like. Are We What We Have Been Influenced By? Have you ever thought about the past influences you show in the way you play Chess?. Think about it for a while. My early Chess influences were , in this order, Karpov-Petrosian-Nimzowitsch (and the Hypermodern movement)-Botvinnik-Fischer and Spassky . I have learnt many things from all of them. If I reduce the list it would read: Karpov-Nimzowitsch et alii-Fischer-Spassky. Now you may say: “So what? Different chessplayers,different styles, etc.” Well, let’s try to find the common denominator. In fact when we speak of “influences” in Chess I immediately think of openings and certain middlegame recurrent positions. 1.- Openings: Karpov (from his beginnings till around 1986), Fischer, Spassky and Nimzowitsch have had 1. e4 as their main opening as White. As Black Karpov ,Fischer and Spassky have played the Sicilian (my main weapon). The four have played Hypermodern defences : the Nimzoindian, the Queen´s Indian, the Grünfeld, the King’s Indian, the Benoni. I have played all of them + the Orthodox (Spassky’s weapon for many years too). The Hypermodern reaction to the “classicism” represented by Tarrasch is known by everybody. I began to play Hypermodern Defences and typical middlegame set-ups avoiding the invasion of the centre with Pawns but trying to control and attack it from the wings. In my early years I used the English, the Reti or the Barcza System as White. I even tried bizarre systems like 1. c4, e5 2. e4 or 1. e4, c5 or …e5 / 2. c4. Or the Dresden Variation of the English, a most cherished set-up of Nimzowitsch’s. In Chess we could distinguish several periods (Chess writers call them “Schools”): Morphy, Anderssen et alii belonged to the Romantic School. Then came the Classical School with Tarrasch and contemporaries. One step forward and we have the Hypermodern School (curiously both Tarrasch and Nimzowitsch claimed they were trying to explain Steinitz’s ideas … to reach conclusions poles apart…). Afterwards, the Soviet Chess School, comprising everything, re-formulating many concepts,discovering new ones, etc. Today’s chessplayers follow an eclectic path (I guess). In a period of ultra-dynamism you can still find positional masterpieces in a classical or a hypermodern style be those what they may. I have written that certain school of thought has proclaimed that there is no strategy these days because the opening stage has been so extended that modern “tabiyas” may place the game between the 20th and the 30th move. (You can notice it at top-level Chess and in CC). But nearly everybody has a favourite idol : you may like Capablanca’s classical approach or Tal’s romantic one. Etc. 1.- This is not a mate problem. 2.- Study the position and try to imagine how White can proceed and how Black can defend his position. 3.- You can do it without moving the pieces. Then, try to find a solution by moving the pieces if necessary. 4.- You can cover the solution and try to find the first move and so on checking your election against the solution as if it were a game. White must play for the win, Black will try to , at least, get a draw. This is an exercise of threats/defences ,threats/counterthreats. Remember that , in Chess, all the work you do always pays off, always reward. 1.- Ng1, Kd2! / 2. Nf3+ , Kd3! /3. Ke1, Ke3 / 4. Ne5, Ke4 /5. Nc4, Kd3 6. Nd2, Ke3/ 7. Nf3, Kd3 /8. Kf1! Ke3 / 9. Ne1, Kd2/ 10. Nc2!, Kd1 / 11. Nb4, Kd2 / 12. Nd5 winning. A typical game … even for today’s standars. 1. e4, c5/ 2. Nf3 , Nf6 (one of Nimzowitsch’s pet variations. It pursues the same idea as the Alekhine Defence: to provoke the advance of the enemy’s Pawns overextending the centre and try to destroy it from the wings. )/ 3. e5, Nd5/ 4. 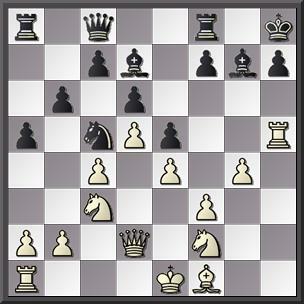 Nc3, Nxc3/ 5. bxc3 (today 5. dxc3 is considered better) , 5…, Qa5 (Also the typical Nimzo’s bizarre move) / 6. Bc4, e6/ 7. Qe2, Be7/ 8. 0-0, Nc6 (Nimzowitsch proposed …b6 instead) / 9. Rd1, 0-0/ 10. Rb1, a6/ 11. d4 (White has no problems. Nimzo gives a variation showing that now 11…, Qxc3 is not possible but computer analysis may give a second opinion: this is your work for today) 11…, b5/ 12. 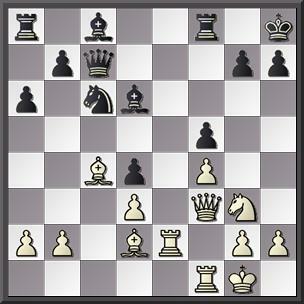 Bd3 (Nimzo says nothing, but here 12.d5 must strongly be taken into consideration .Work it out by yourselves) ,…, c4/ 13. Be4, f5/ 14. exf6 ep, Bxf6/ 15. Ne5, Bxe5/ 16. dxe5, Rf7/17. Qh5! (and Nimzowitsch has managed to create an attacking position … for White. White reaches the King’s side ,creates threats and destroys Black defences there) 17…, g6/ 18. Bxg6, hxg6/ 19. Qxg6, Rg7/ 20. Qe8, Kh7/ 21. Qh5, Kg8/ 22. Bh6, Qxa2 (only move) 23. Bxg7, Kxg7/ 24. Qg5, Kf7/ 25. Rbc1, Qa3/ 26. Re1, Ke8 / (Now Nimzowitsch writes that White, instead of trying to chase Black’s King he should have remembered he had a passed Pawn – h2-. Yates lets victory slip trhough his fingers…) 27. Re4, Qe7/ 28. Qh6, Kd8/ 29. Rd1, Kc7/ 30. Rg4, Qc5/ 31. Re4 , Ne7/ 32. Qd2, Nd5/ 33. h4 (too late), Bb7/ 34. Rd4, Rh8 (Bishop and Rook work as a deadly team) / 35. Qe1, Bc6/ 36. g3, Qf8/ 37. f4, Qf5/ 38. Qf2, Qh3/ 39. Qh2, Qg4/ 40. Qf2, Rxh4/ 41. f5, Nf6 /42. Qe3, Qxe4!/ 43. Rxd4, Rh1/44. Kf2, Ng4/45. Ke2, Rh2/ 46.Ke1, Nxe3 / White resigned. A typical game with some imprecissions and an excellent example of tournament Chess. 1. e4, Nc6 (Nimzo’s trade mark again) / 2. Nc3, e6/ 3. d4, Bb4/ 4. Nge2, d5/ 5. e5, h5 (Again typical in Nimzowitsch and his (extreme) “prophylaxis theory” though he says 5…, Nge7 was better) 6.Nf4, g6/ 7. Be3, Bxc3?! (again …Nge7) / 8. bxc3, Na5/ 9. Bd3, Ne7/ 10. Nh3, c5/ 11. Bg5, c4/ 12. Be2, Nac6/ 13. Bf6, Rg8/ 14. 0-0 (Nimzowitsch recommends 14.Ng5),…, Qa5/ 15. Qd2, Nf5 / 16. Rfd1, Kd7/ 17. Ng5, Rf8 /18. h3, Kc7/ 19. g4, hxg4/ 20. hxg4, Nfe7/ 21. Kg2, Ng8 (Nimzowitsch labels this as an error and proposes 21…, Bd7/ 22. Rh1, Rae8/ 23. 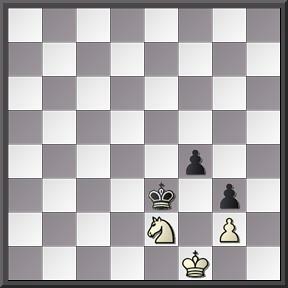 Rh7, Nd8 ) / 22.Bg7, Re8/ 23. Rh1, (Nxf7 – Nimzo), Bd7/ 24. Rh3, Nd8/ 25. Rf3, Rc8/ 26. Rh1?! (26 Nxf7 or 26. Qc1 -Nimzo-), … Qxa2 27. Rh7 , Kb8/ 28. Nxf7, Nxf7/ 29. Rxf7, Bc6/ 30. Bf6, a5/ 31. Rh1, Qb2/ 32. Bg5, Rf8/ 33. R7-h7, Rc7/ 34. Rxc7, Kxc7/ 35. Qc1!, Qxc3/ 36. Qa1, Qxa1/ 37. Rxa1, Ra8 (Black has managed to disentangle himself taking advantage of defensive subtleties, intermediate moves his opponent inacuracies and his typical defensive technique. The process is worth a study. The game enters a new stage : manoeuvres to break White’s position whose Bishop pair offers good defensive perspectives ) 38. Bd2, b6 /39. Kg3, Ne7/ 40. Bd1, Bd7/ 41. Bb4, Nc6/ 42. Bd6, Kb7/ 43.c3, b5/ 44. Rb1,b4/ 45. Ba4, b3/ 46. Bxc6, Kxc6 (Like Steinitz, Nimzowitsch saw the King as a strong piece, and used it accordingly: it is not a piece to be hidden in safety: he must play with the other fellow companions. In this respect, we can say both Masters … played a piece up!.) 47. g5, Ra7/ 48. Rb2, Rb7/ 49. Kf4,Bc8/ 50.Kg3, Rb4! 51. cxb4, a4 / 52. b5, Kxb5/ 53. 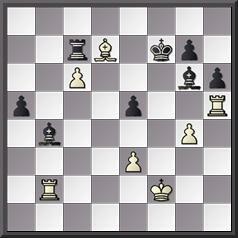 Ba3, c3/ 54.Rb1, Kc4/ 55. f4, Kxd4/ 56. Kf2,Kc4/ 57. Ke1, d4/ 58. Ke2, Kd5/ 59. Kf3, Bb7/ 60. Re1,Kc4/ 61. Kf2, b2/ 62. f5, exf5/ 63. e6, Bc6/ White resigned. He used to say that the process in a typical game was something like: RESTRAINT-BLOCKADE-DESTRUCTION . Handling a blockade game is difficult. Some of the concepts expressed by Nimzowitsch are difficult to grasp. I understand that when he speaks of “blockade” that implies much more than a blockaded center. In fact, I believe that a typical “blockade” game implies to put under a blokade network as much territory as possible: either the whole board or at least the center+ one of the wins. Nimzowitsch himself stated that it was very difficult to protect an extense blockading network against ruptures, but that forceful attempts to break a blockade are condemned to failure. 1. c4, Nf6 2. Nc3, c5 3. g3, g6 4. Bg2, Bg7 5. d3, 0-0 6. Bd2 ,e6 7. Qc1, d5 8. Nh3, d4 9. Nd1, Na6 10. a3, Qe8 11. b3, e5 12. Nb2, Bg4 13. 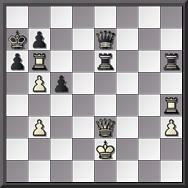 Ng5 , Rb8 14. b4, b6 15. b5, Nc7 16. a4, Bc8 17. a5, Bb7 18. f3, Ne6 19. a6, Ba8 20. h4, Nh5 21. Nxe6, Qxe6 22. g4, Nf6 23. Bh3, Qd6 24. Nd1, h5 25. g5, Nh7 26. Nf2, f6 27. gf6, Bxf6 28. Bg5, Bxg5 29. hg5, Rf4 3. Rg1, Rbf8 31. Bf1, Rh4 32. Qd2, Rh2 33. Rg2 Rxg2 34. Bxg2, e4 35. de4, Qg3 36. Kf1, Nxg5 37. Kg1, Rxf3 38. Qxg5 , Qxg5 39. ef3, Qe3 40. Rd1, Qb3 41. Rc1, g5 42. Kh2, Qe3 43. Rf1, Qe2 44. Nh3, d3 45. Nf2, d2 46. Kg1, Qxc4 47. Rd1, Qc1 48. Bh3, g4 49. fg4, Bxe4 50. gh5, Bf3 and Berger resigned. 1. d4, Nf6 2. Nf3, e6 3. c4, b6 4. g3, Bb7 5. Bg2, Bb4 6. Nc3, 0-0 7. 0-0, Bxc3 8. bc3 9. a4, a5 10. Ba3, Nbd7 11. Nd2, Bxg2 12. Kxg2, e5 13. e4, Re8 14. f3, Nf8 15. Rf2, Qd7 16. Nf1, Ng6 17. Bc1, Kh8 18. Ne3, Ng8 19. h4, Qc6 20. h5, N6e7 21. Qd3, Rf8 22. g4, g6 23. Bd2, gh5 24. Nf5, Nxf5 25. gf5, Nf6 26. d5, Qd7 27. Qe3, Rg8 28. Kh1, Qe7 29. Rh2, Rg7 30. Be1, Nd7 31. Rxh5, Rag8 32. Bf2, f6 33. Rh2, Rg5 34. Bh4, Rh5 35. Rg1, Qf8 36. Rg4, Qh6 37. Qxh6, Rxh6 38. Bf2, Rxh2 39. Kxh2, Rb8 40. Rg1, Nc5 41. Ra1, Kg7 42. Be3, Kf7 43. Ra2, Nd3 44. Rd2, Ne1 45. Kg3, Rg8 46. Kf2, Ng2 47. Bh6, Nf4 48. Bxf4, ef4 49. Rd1, Ke7 50. Rh1, Rg7 51. Rh4, c6 52. Rxf4, h5 53. Rh4, Rh7 54. Rh1, Kd7 55. Rg1, cd5 56. cd5, h4 57. Rg8, h3 58. Ra8, Rh6 59. Ra7, Kc8 60. Kg1, h2 61. Kh1, Rh3 62. Rf7, Rxf3 63. Rxf6, Kd7 64. Rf7, Ke8 65. Rb7, Rxc3 66. Rxb6, Ke7 67. Rb7 ,Kf8 68. Ra7, Rc4 69. Rxa5, Rxe4 70. Ra7, Rf4 71. a5, Rxf5 72. a6, Rf1 73. Kxh2, Ra1 74. Ra8, Kg7 75. Kg3, Ra4 76. Kf3, Kf6 77. a7, Kg7 78. Ke3 and Colle resigned. 1. e4, e5 2. Nf3, Nc6 3. d4, ed4 4. Nxd4, Nf6 5. Nc3, Bb4 6. Nxc6 ,bc6 7. Bd3, d5 8. e5 (The phase of restraint starts) …, Ng4 9. 0-0 ,Qh4 10. Bf4, Nh6 11. Ne2, Nf5 12. c3, Bc5 13. b4, Bb6 14. Qc2, Ne7 15. Bg3, Qh6 16. Kh1, 0-0 17. f4, f5 18. Bf2 ,Be6 19. Bc5! (now the process of establishing a blockade network) ,… Bxc5 20. b5 ,Kh8 2. Nd4, Rae8 22. Rab1, Bc8 23. Rf3, g5 24. Rh3, Qg7 25. Rg3!, g4 26. Re3, Qg6 27. Qf2, Ng8 28. h4! ,Bd7 29. g3, Ne7 30. Re2 ,Rb8 31. Reb2 ( final step: destruction) ,… Qg8 31. Rb7, Rfc8 32. Rb7, Rfc8 33. Ba6! ,Rxb7 34. Rxb7, Rb8 35. Qb2!, Rxb7 36. Qxb7 ,Qd8 37. Qxa7, Ng6 38. Bb7, Nxh4 39. Qa8! Black resigned. In positional/strategical games it is very interesting to study the game from the strategical point of view and then from the tactical one, tying to find the justification of every move. THREATS <=====> INITIATIVE ——-> RESTRAINT—–> BLOCKADE ========> MORE SPACE/MOBILITY ————–> ———-> DESTRUCTION. 1) Uncoordination of the pieces which are unable to prevent all the threats. 2) Ruptures impossible to stop so as to open up the position . 1. d4, Nf6 2. Nf3, e6 3. c4, c5 4. d5, ed5 5. cd5, d6 6. Nc3, g6 7. Bf4, a6 8. a4, Bg7 9. e4, 0-0 10. Be2, ,Bg4 11. 0-0, Bxf3 12. Bxf3 ,Qe7 13. Re1, Nbd7 14. Qc2, Ne8 15. Qd2, Nc7 16. Bg5, f6 17. Bh6, Bxh6 18. Qxh6, b5 19. b3, b4 20. Nd1, f5 21. Qd2, Ne5 22. Nb2, f4 23. Nd3, h5 24. Be2, ,Nxd3 25. Qxd3, Qe5 26. Qh3, Rf7 27. Rad, Kg7 28. Bc4, a5 29. Qd3, g5 30. f3, ,Kf6 31. Kf2, Rg8 32. Qb1, g4 33. Qa1, Rfg7 34. Bf1, Qxa1 35. Rxa1, Ke5 36. Rad1, Ne8 37. Ke2, Nf6 38. Kd3, c4 39. bc4, Nd7 40. Kc2, Nc5 and Burger resigned. An excelent example. 1.d4, Nf6 2. c4, e6 3. Nf3, b6 4. a3, Bb7 5. Nc3, d5 6. cd5, Nxd5 7. Qc2, Nxc3 8. bx3, Be7 9. e3, Qc8 10. Bb2, c5 1. Bb5, Bc6 12. Bd3, c4 13. Be2, Nd7 14. a4, a6 15. 0-0, 0-0 16. e4, b5 17. Ba3, Bxa3 18. Rxa3 , Qb7 19. Nd2, Nb6 20. a5, Nd7 21. f3, e5 22. d5, Qa7 23. Kh1, Bb7 24. Raa1, f5 25. Rad1, f4 26. g4, ,Rf6 27. Qb2, Re8 28. Rg1, Bc8 29. Rg2, Nf8 30. h4, Rh6 31. Rh2, Qe7 32. h5, g6 33. Qb4, Kg7 34. Rg1, Nd7 35. Qxe7, Rxe7 36. hg6, Rxh2, 37. Kxh2, Kxg6 38. Kh3, Nc5 39. Kh4, Rc7 40. Rb1, Nb7 41. Ra1, ,Nd6 42. Nb1, R7 43. Na3, Kf6 44. Rg1 N7 45. Kh3, h5 / and Timman resigned. Another superb example. Nimzowitsch wrote his masterpieces as a reaction against what he considered Tarrasch’s dogmatism. I think every chessplayer should read or study “My System”, “Chess Praxis” (“My System in Practice”/ “The Practice of My System”) and “Blockade”. Apart from the new approaches concerning the middlegame, it may be debatable whether the most important contributions are in the field of the openings and their relations with middlegame plans under the new approach. The Nimzoindian and Queen’s Indian Defences. The Nimzowitsch Defence against 1. e4. The Dresden Variation in the English. Nimzowitsch’s 1.b3 (and 1.f4 , …/ 2. b3), the Advance Variation in the French. All these by Nimzowitsch. Apart from those ones, he also played the Caro-Kann system: 1. e4 c6 2. d4 d5 3. de4 Ne4: 4. Nf6, and a system with …b6 in the French Defence as Black . He also had a variation in the Sicilian and the system 1. e4 c5 2. Nf3 Nf6 . Reti with his Reti opening. Bogoljubow with his defence, the Alekhine Defence and all the Indians systems, the Bacza Opening,, Grünfeld and his defence, the Two Fianchetto Opening, etc. Fianchettoes were the order of the day and so today we play the King’s Indian, the Benoni, the Pirc and all sort of first move fianchettoes as White and as Black, apart from the English opening, “the strongest first move in the world” according to Tartakower. So, today we are playing the defences/openings these chessplayers invented or advocated. And this implies that the middlegame principles they discovered are totally sound. The reaction against classicism in Chess meant a new approach in the concept of the centre and this implied that a whole new set of openings began to be used. They realised that there was life beyond 1. e4 e5 , 1. d4 d5 and the occupation –de facto– of the central squares: the centre could be controlled from the flanks and the strategy was one of accumulating energy instead of space. Other ideas were that Black could fight for the initiative conceding the centre and attaking it from the sides with Bishops on g3/b3/g7/b7, and that the defensive resources were there to be found instead of seeing how White smashes Black through beautiful combinations (defined as “one plays, the opponent applauds”). The concept of weakness was reassessed and reformulated (“a weakness is not that important if it cannot be attacked), new values of the pieces were established (in the Nimzoindian Black readily plays ..Bc3: ceding the Bishop-pair in the very opening stage and without tactical compensation, for instance), and the study of the different Pawn constellations was of paramount importance. Chess strategy suffered a revision. Wild opening gambits were not taken into consideration, defensive resources praised and what at first were dubbed as bizarre (even ugly) ideas slowly began to take over. In a sense, the Soviet Chess School synthetised the valid classical ideas and the new ones developing the machinery which dominated the Chess world for decades. Nimzowitsch is reknowned mainly for two books: “My System” (1925) and “Chess Praxis” (“The Praxis of My System”) (1929). But there is another publication which has passed if not unnoticed very little considered: “Blockade”, published in 1925 too. This is more a booklet -the edition I own has 91 pages and was published in the USA by Chess Enterprises Inc. I own another edition of Nimzowitsch’s writings this time in Russian: in a single volume the three books. You may notice that in “Chess Praxis” there is a chapter devoted to the theme of blockade too. Incidentally, on move 15th Nimzowitsch in his notes says that “…this and the next move are mistakes” though he puts a question mark only on the 16th move. This brought to my mind something Abrahams believed : he said that a strategical mistake did not imply a tactical mistake, but that two strategical mistakes do imply a tactical one (!! ).